This Chocolate Sundae Royale is a decadent chocolate ice-cream extravaganza. It’s made with dark and white chocolate ice-creams, chocolate caramel fudge sauce, blackcurrant brownies and some blackcurrant sauce to cut through the richness. All you need is a suitable celebration to justify the calories. When Mõvenpick asked their fifteen favourite bloggers (of which I’m one!) to create a sundae using their ice-cream, perhaps unsurprisingly my thoughts jumped to chocolate. I was planning on an All Chocolate Sundae project using dark and white chocolate ice-cream, chocolate brownies and chocolate sauce. However, the plan was hijacked by these blackcurrants. Adding cassis to champagne makes for a Kir Royale, so I reasoned that adding blackcurrants to my chocolate sundae would not only enhance it, but make it fit for a monarch – a Chocolate Sundae Royale, no less. Mõvenpick ice cream takes me straight back to Switzerland where I was a teenage au pair. Country bumpkin that I was, I found the ice-cream parlour serving Mõvenpick sundaes to be amazingly glamourous. My introduction consisted of a magnificent affair with 15 balls of differently flavoured ice-cream – I remember it well. So when I was sent two tubs of their ice-cream, two sundae glasses and matching spoons, I was all set to relive my dissolute youth. I chose Swiss Chocolate which not only tasted of rich dark chocolate but also contained generous amounts of Swiss chocolate shavings; I paired it with a contrasting creamy White Chocolate containing chunks of white chocolate. Both were way too tasty and the leftovers didn’t hang around in our freezer for very long. These two, along with eight other flavours, can be purchased in 900g tubs from Ocado. The ever-inspiring Elizabeth is hosting We Should Cocoa this month over at Elizabeth’s Kitchen Diary. She has chosen chocolate ice cream and toppings recipes – you can do either or both. Ice-cream in July is becoming a bit of a tradition. Do have a look at the July 2013 We Should Cocoa ice-cream round up. Well I knew I was going to be getting some chocolate ice-cream, so I needed to come up with something particularly good for a topping. CT gave me a most wonderful book for my birthday, Mast Brothers Chocolate: a family cookbook by Rick & Michael Mast. The book is full of dark and luscious recipes along with stories of their bean to bar chocolate making adventures. A recipe for hot caramel fudge sauce caught my eye and I knew that was the one I wanted to use for my Chocolate Sundae Royale and my entry to We Should Cocoa. At this point my chocolate ganache separated out. Don’t despair if this happens to you. Just heat up some more cream and pour it in, stirring carefully. It worked for me, anyhow. I ended with a thick but beautifully smooth and shiny warm chocolate caramel fudge sauce. Pride comes before a fall, but I think this might be one of the best sundaes I’ve ever eaten. Maybe because I had it for breakfast! I’m not normally one for sweet foods in the morning, so I reckon this was the most decadent breakfast ever. My excuse was simple: I had to make it early in the morning whilst the light was best for photographic purposes and before the house heated up too much. Different layers, textures, tastes and temperatures made a sundae surprise to keep us guessing; we were never quite sure what was coming in the next mouthful. Blackcurrant was an inspired addition; it had a punchy piquancy and the tart fruit cut through the richness of the chocolate and cream. A slug of cassis could easily be added to the blackcurrant sauce to make this even more decadent than it already is. I made blackcurrant brownies, especially for this chocolate sundae royale, but you can use whatever brownies you prefer for this recipe. You’ll find loads of brownie recipes here on Tin and Thyme to choose from. Or, if you don’t have time to make any, I won’t tell if you acquire them from some other source. 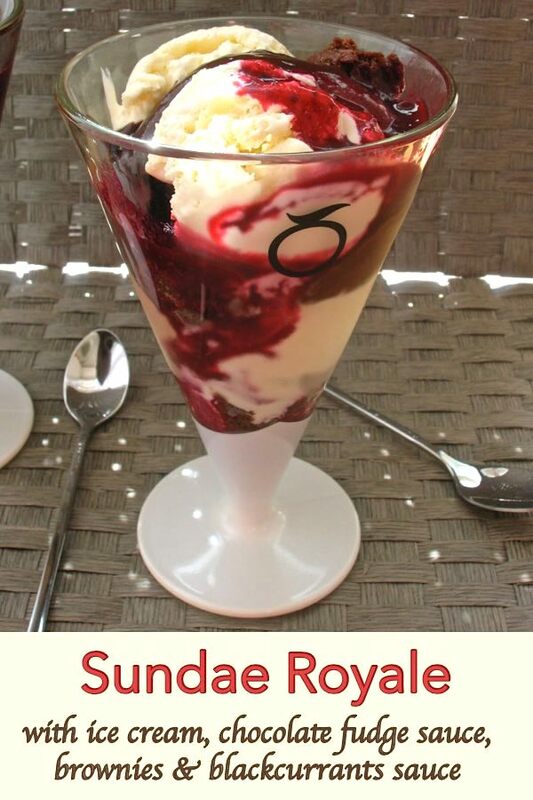 This Chocolate Sundae Royale is my entry to the Mõvenpick Ice Cream Blogger Competition. The creator of the favoured recipe wins a two-hour masterclass with the Langham’s head pastry chef, Cherish Finden, followed by afternoon tea for two at the Palm Court. Fingers crossed. Appropriately enough given the hot weather, this month’s Family Foodies event is Chill Out, Baby, making my sundae eminently suitable (although it might be best to omit the optional cassis). It is hosted this time by Vanesther of Bangers & Mash and is hosted alternately with Lou of Eat Your Veg. This month’s Blogger Scream for Ice Cream over at Kavey Eats is all about holidays. Well, the Swiss sundaes that inspired this were not exactly holiday related – I don’t think I’ve ever worked so hard as I did when I was an au pair. My entry is, however, travel related, so I hope it counts. Thanks for visiting Tin and Thyme. If you make this Chocolate Sundae Royale, I’d love to hear about it in the comments below or via social media. Do share photos on social media too and use the hashtag #tinandthyme, so I can spot them. For more delicious and nutritious recipes, follow me on Twitter, Facebook, Instagram or Pinterest. Chocolate Sundae Royale. PIN IT. 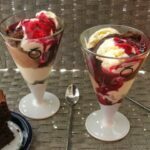 A decadent chocolate ice-cream extravaganza made with dark and white chocolate ice-creams, chocolate caramel fudge sauce, blackcurrant brownies and some blackcurrant sauce to cut through the richness. Melt the sugar in a pan over a medium heat, then let it simmer for a couple of minutes until it turns a bronzy colour. Remove from the heat. Meanwhile heat the double cream in a separate pan with the vanilla extract until hot. Pour into the caramel and stir hard until smooth. Simmer the blackcurrants with 75 ml water for about ten minutes to soften the fruit. Press the mixture through a sieve, extracting as much juice as possible. Throw the remaining pulp in the compost. 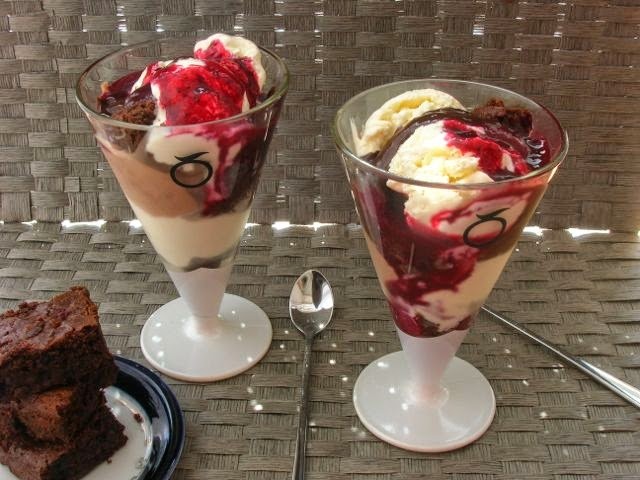 Place one of the blackcurrant brownie quarters at the bottom of each sundae glass. Top with a scoop of white chocolate ice-cream followed by some of the chocolate caramel sauce. Add 2 scoops of Swiss chocolate ice-cream followed by the remaining brownie quarters. Top with 2 scoops of white chocolate ice-cream, then drizzle the chocolate and blackcurrent sauces over the top until they flow down the sides. If the caramel ganache separates out, heat a ¼ cup of cream and pour this in, stirring carefully. I was sent a silicone cake mould to try out. I was not expected to write a positive review and all opinions are, as always, my own. Thanks to my readers for supporting the brands and organisations that help to keep Tin and Thyme blithe and blogging. Choclette this looks rather good. And with 25C predicted today a perfect day to make it. Thanks Bintu – it’s so hot the only thing I want to eat is ice-cream. Thank you – we’ve become a little addicted and have been feasting on one for the last three days. Thanks Karen, blackcurrants and chocolate is my latest favourite combination! Everything here sounds absolutely amazing. Perfect for this hot summer day too. Thanks Dannii – ice, ice and more ice needed I’m feeling. Oh Natasha, I could eat it right now too, but I’m on a fast day! That sundae looks just wonderful! Thanks Alicia – we were so enamoured we had it three days running – might just get a 4th out of it, although the chocolate sauce has disappeared and there is only one brownie left. Thanks Dom, it’s sweet tangy and very very moreish. It felt truly naughty eating this for breakfast Vanesther, but gosh it was good. Lovely combo and fantastic colour! The addition of the blackcurrant is superb. Movenpick ice-cream is so creamy and delicious….. shame it is so difficult to find! Argh, I am now DESPERATE for an ice cream! These look amazing. So indulgent and I want one now – its already hot! 2 flavours of ice cream, 2 different sauces and brownies = wow! LOL, this looks lush! Thank you so much for linking up with mine too. And how did I know yours would be a chocolate fest! mmm..I want to drink that blackcurrant sauce!! This is a fantastic combination. What a scrumptious sounding ice cream Choclette- I’m sure it vanished in seconds in thus gloriously hot weather! I could happily sit in a bath full of that chocolate sauce! This looks utterly heavenly! Oh goodness me! Well, if we eat with our eyes, I’ve already eaten this one! Looks so lovely! That looks so good and I love those Movenpick Sundae glasses! Those sundaes look so so so good – I wish I had memories of eating ice cream in Switzerland but this sundae actually makes me think of McDonald’s ice cream with chocolate sauce when I was little – never have them these days but I remember the thick chocolate sauce very fondly and your sauce makes me think of it – I am sure it is far superior and probably just the thing for me now that my tastebuds are more sophisticated. Good luck with the competition.